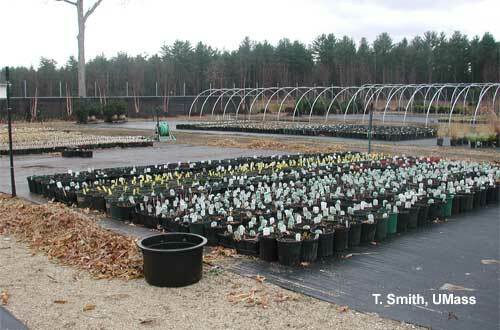 Most containerized perennials and woody nursery stock held over winter need protection from cold. Roots are much less cold-hardy than shoots and unlike field grown plants, the roots of container-grown plants are not buffered from cold temperatures by the soil. In addition to root hardiness, factors such as soil moisture, temperature fluctuations, and root development in the container also affect plant survival. The type of overwintering technique used is determined by the plant species and the ability of their roots to withstand cold temperatures during winter. Plants with roots that can withstand colder temperatures may only need to be consolidated and the outside perimeter protected with bales of hay or bags of leaves. This can save time and money compared to using more significant systems. Growers must first determine the extent of winter protection required for the plants. Tables 1 and 2 list some plants along with their root killing temperatures. Woody Plants and herbaceous perennials should be completely dormant or hardened off before covering for the winter. In zone 5 and 6, this is typically in late November. Herbaceous perennials should be potted up by late September or early October to allow them to become established for several weeks before cold temperatures arrive in late November. Poorly established and pot-bound plants tend to overwinter poorly. Plants that die back should be trimmed back to the crown and cleaned up prior to covering. Evergreen perennials such as Phlox subulata and Iberis sempervirens should be protected from direct contact with overwintering coverings either by laying them on their sides or using a structure over them. Consolidate plants as close as possible and one to two days before covering herbaceous or woody ornamentals, water everything well to prevent desiccation, allowing foliage/branches to dry thoroughly. Moist media freezes slower and releases heat compared to dry media, offering protection to the roots. Check moisture level of the media during the winter and irrigate if necessary. In an unheated polyhouse water may be needed as often as once every two weeks, while ground beds covered with thermal blankets hold moisture and probably will not need watering. Avoid over-watering plants which will promote root, crown and foliar diseases. Some growers treat plants with a broad spectrum fungicide, and then allowed to dry prior to covering especially if there has been a history of disease. Provide rodent protection. Greenhouses (if used) can be made rodent tight by burying fine mesh screen wire such as hardware cloth around the perimeter under ground and bending it outward at a 90 angle leaving it at least 6" deep. Mow and clean vegetation around overwintering areas to eliminate protected areas for rodents. Use commercially available baits or repellents such as human hair sprinkled around or cut up deodorant soap. Begin baiting for mice about a month before covering plants to reduce their population. Unheated Hoophouses covered with 4 - 6 ml white polyethylene. White polyethylene reflects solar radiation and will not heat up as much as clear polyethylene. However the lack of light in the spring can cause plants to stretch. If clear poly film is used, active ventilation will be needed. Once temperatures consistently drop to 25-30°F, pots inside can be covered with a lightweight foam blanket to further protect plants from extreme cold. The thermoblanket is placed over the plants only for the duration of the extremely low temperatures. Houses oriented in a north-south direction are cooler at mid-day than houses in a east-west orientation. By using white poly and orienting overwintering structures north-south, cooler leaf and air temperatures inside the house are obtained thus reducing transpiration. The temperature around the inside perimeter of the house will be colder than the middle of the house. If possible, place cold sensitive species in the center of the house and more tolerant species around the edge. Heated Greenhouse or Polyhouse with Roll-up Sides is another option. Heat is used to keep the soil temperature at a minimum of 25°F for nursery, and in a range of 30 to 34º F for most perennials. Use a soil thermometer to verify that plants are in this range. If the temperatures warm up for several days above 40º F then ventilation should be provided. This is the best method for temperature control for overwintering herbaceous perennials. It also provides more control over moisture levels, plant growth, and heat build-up. Greenhouses or polyhouses covered with two layers of clear poly film are heated in the fall to 50°F until all of the plants (perennials) are well-rooted, then the temperature is slowly lowered to 35°F where that temperature is maintained throughout the winter. Clear poly is used to allow the maximum amount of sunlight exposure to the crop, foliage stays drier and in the spring, plants break dormancy earlier allowing for early shipping. Roll-up sides maintains the same temperature inside as outside, whether during a winter thaw or in the spring when warm sunny days cause a rapid rise in the greenhouse temperature and push the plants along too quickly. Rolling up the sides is also useful for hardening off plants in the spring and dropping them for protection if unexpected cold weather or snow arrives. Many perennial growers feel it is easier to keep plants thawed than frozen due to the variability of the weather. Structureless systems involves laying protective covers directly over plants and securing the edges. The big disadvantage of this system is you cannot check the plants as easily. Once the plants are covered, they should remain sealed for the winter. Also, towards the end of the winter when day temperatures increase, venting to inhibit plant growth is more difficult. When using these systems larger plants are laid on their sides with the crowns towards the middle. In the production yard, plants are placed pot to pot in an upright position on the ground, tall plants and woody plants are leaned over just like laying shingles and plants with foliage are laid on their side. Plants are covered with microfoam – poly cover. The blanket is pulled tight over the containers and the edges secured. Follow the manufacturer's recommendation. In areas where air temperatures are likely to fall to -10F, or exposed to high winds, consider using a double layer. Thermoblankets tend to trap and retain moisture and problems under the blankets are difficult to detect because the blankets are opaque. Also, venting may be needed during unexpected periods of warm winter weather. No covering. Some plants are root hardy enough that no protection may be necessary unless very unusual winter temperatures are experienced. These plants may only need to be consolidated and left uncovered. If the area is not protected from winter winds, then it may be advantageous to protect the perimeter with bales of hay or bags of leaves. If this system has not been a used at your nursery, it is advisable to try this with a few plants of each species. The advantage of this system is overwintering space is freed up and your production area is increased. A variety of other techniques have been utilized to protect container grown plants during winter, including retractable-roof greenhouses, covered cold frames, earthen pits, sunken frames, root cellars, barns and sheds, covering with evergreen boughs and deep snow. The key to overwintering is keeping the plants cold and alive but not actively growing. After the plant's chilling requirement has been satisfied, plants can respond to warm temperatures. In late winter as the temperature increases, plants can de-acclimate to cold temperatures. If the temperature decreases slowly, plants can re-acclimate to colder temperatures but fast drops in temperature can cause cold injury to plant tissue. Although white polyethylene covered houses warm up less, vent the house by opening the end doors if the inside temperature approaches 45-50°F. Plants should not be uncovered until after the danger of subfreezing temperatures. In early spring, some growers cut holes in the poly to ensure adequate ventilation while still providing adequate protection from frosts. Although difficult, it is important to check that growth of plants under structureless systems has not started. Depending on the materials used to protect plants, some coverings can have a high insulating value that is effective at retaining heat. Etiolated growth can occur and be very susceptible to cold injury. By uncovering, the plants will remain dormant. This can be a nuisance where mild temperatures occur periodically during the winter. It is not uncommon to see plants being covered as late as November or early December. Waiting as long as possible to cover plants will allow plants to harden off which minimizes the risk of winter injury. A general guideline for covering is to use the F (frost date) + 30 or F (frost date) + 45. For example, if the first frost date is Oct. 15 then F+ 30 or F+ 45 would be November 15 or November 30. Plants are usually uncovered as soon as possible in spring and will vary across the state depending on weather conditions. The goal is to prevent premature shoot growth and ensuring that unusually cold weather in late winter and early spring does not kill or injure plants. Inspect protected plants frequently for signs of shoot growth and vent to introduce cool air to slow plant development and harden plants. In summary, proper overwintering of container grown ornamentals is essential to maintain high plant quality. Several overwintering systems have been developed. The choice depends on capital as well as the amount of protection required by the plants. Economically, it doesn't make sense to over-provide winter protection. To overwinter plants, group the plants together, water thoroughly, and cover the plants after they have acclimated to the cold but before danger of subfreezing temperatures. Adequate moisture should be maintained and irrigation may be necessary during the winter when using some overwintering systems. Uncover the plants when temperatures begin to increase in early spring but after danger of subfreezing temperatures. Table 1. Average killing temperatures for roots of selected species of woody ornamental plants and ground covers. Highest temperature that killed more than 50% of root system and reduced top growth. Drumgool, C. 1997. Overwintering Perennials in the Greenhouse. The Mayflower, Massachusetts Flower Growers' Association, No. 2. Fisher, P. 2001. Overwintering Perennials in Containers. University of New Hampshire.